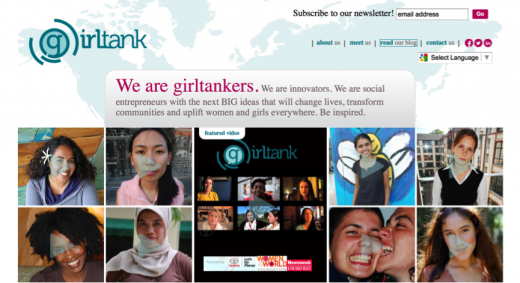 Girltank aims to encourage women and girls to use their talents and energy to shape the future world. Here is an introduction from their web site. We’re girltank. We are a network of 1,500+ women social entrepreneurs and changemakers from all over the world. And we’re shaking things up! We believe in the power of entrepreneurship. We believe in the necessity of teamwork. We believe in the genius of the crowd. But most importantly, we believe in women and girls. We believe that passionate, inspired, committed women and girls have the next BIG ideas that will change the world! We’re a diverse team, committed and passionate about empowering women and girls through innovative solutions. Our mission is to inspire, connect and fund female social entrepreneurs and changemakers who have bold and transformative social innovation projects. Our multimedia library shares best practices, advice and the inspira- tions of female change- makers with each other, the next generation of social entrepreneurs and society at-large. Our think tank houses our capacity-building course and workshops, and connects change- makers to each other and to the social entre- preneurial eco-system. Our crowdfunding platform provides social entrepreneurs and changemakers with an online method to secure funding for their ventures. Women and girls have trouble accessing capital and building critical capacity skills that are necessary to create viable business models, launch sustainable ventures and secure backing from funders. Female changemakers often deal with isolation and feelings of loneliness due to gender discrimination, disempowering cultural and religious beliefs and little or no access to technology and information. You can discover more at their web site, which also describes many of the projects.